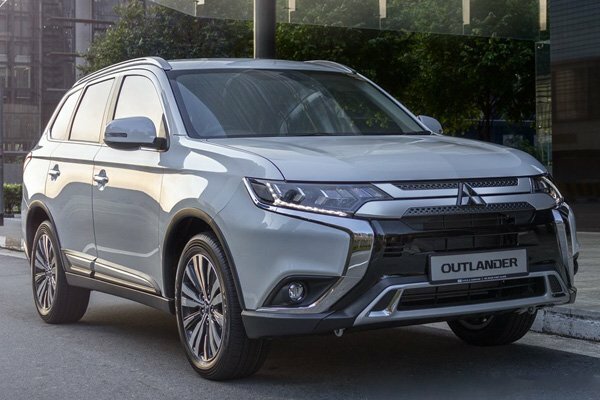 The Outlander may only look refreshed on the outside, but it now comes with a 2.0-litre front-wheel drive variant, and is more appealing than ever. 16 out of 19 (84.2%) reviewers said they would recommend this vehicle to a friend. Just viewed this car few weeks ago, as my dad was looking for a new SUV to purchase. I have to say, it really is a brilliant car, for the new 2019 Variant. They've improved alot of things such as adding air-conditioning towards the back seats and etc, really impressive. It really is a value for money SUV for a family, really good car! Yes, the last two seats might be squeezy, but actually the middle seats have a lot of leg room! I'm a 188cm guy, and when I seat in the middle seats, I have a lot of leg room! My knees are quite far from touching the driver's seat or the passenger's seat infront! If you push the middle seats a tad bit forward, the back seats would have much more leg room! This car is just so simple, yet its perfect in all the aspects of a budget SUV. However, I do feel that the engine should be a 2.4L, as it is a SUV. Unfortunately our government isn't very nice about that. Very silent drive even when revving. Large legroom area in middle seats. Simple interior but very easy to use. Gear shifters behind steering wheel makes it sporty-feel. Handbrake is much more different than past year cars! 2.0L isn't enough for these types of SUVs, should be 2.4L. No doubt, the Mitsubishi Outlander is a handsome looking car. Its Dynamic Shield makes its front looks aggressively sporty and isn't that one of the reason why people like SUVs? 1. The CVT is a drag and it is not doing the reasonably powered engine any justice. Overtaking cars needs tremendous effort from the engine and despite how much it roars, it just feels like the CVT isn't able to thrust the car forward. Accelerating when the car is already traveling over 60km/hr works better, since the car already has some momentum. But if I really want more thrust, switching the car to 4WD Lock will be needed. 2. I believe that the engine reliability should be fine, since Mitsubishi is willing to give the engine a 10yrs warranty. However, I am not so sure about other parts of the car. Within 2yrs after driving the car, things started to fall apart. The weather seals on the doors and car body began to drop off, passenger overhead handle started to come off, just to name a couple. However, don't get me wrong, the Mitsubishi Outlander is not entirely bad. To be fair, besides the 2 key points above, the Outlander does have its positive points like, handsome good looks, good fuel efficiency, comfortable ride with good suspension, sufficient space to take 7pax at any time of the day, etc. All in all, I would say that my experience with the Outlander isn't the worst, but it isn't the best either. In any case, it is still the better Japanese 7-Seater SUV than the other brand, which is also using CVT transmission for its comparatively smaller 7-Seater SUV. Been driving the 2015 2.4L Outlander for more than 3.5 years and decided to check out the new 2.0L model recently. Except for the front portion especially grille, the looks are quite similar. Best colour is again, red! It is scarily quite similar on the inside esp. Dashboard and finishing. There have been improvements though especially with the 2nd row aircon and lower capacity engine (i.E. 2.0L from 2.4L), with some savings on the road tax expected. Unfortunately, there is no sunroof for the new model or option for AWD (only FWD). The price is again, very reasonable and should be attractive to those who want to upgrade from Jap sedans to small/medium SUV. Very attractive pricing for Made in Japan 7-seater medium-size SUV. Like my current, expected to be reliable on the road for years. 2nd row aircon now available which is my current biggest pain point! Too similar exterior and interior to 2015-2017 models. No AWD/4WD option unlike predecessor models. Same narrow width like predecessor models esp. for 3rd row. Cheap in a sense that the quality is sub par to cars like forester,tiguan,x trail. Iterior space is okok,3rd row better than most in the segment.At 125k for the 2.4 it is reasonable. The performance is very average, do not even think about the 2.0, it will be hell.CVT is very whiny, road noise very evident, wind noise almost unacceptable. If lookinfor seven seater should take a look at vw touran or even the grand secnic. Was looking for a 7-seater to replace Stream. Car looks big on the outside, but tight inside, especially the last row. I really experienced how Paul's review done in Malaysia for sitting at the last row. Turn-off for me as I expected it to be better with the bigger exterior. Last row is very tight. Best value for money, the 4WD gives it a continental feel while driving. Big powerful MIVEC makes the Outlander nimble and great for over taking. The only other 7 seater SUV with 4WD I can think of is the XC90 which costs 300k. 7 Seats! 4WD and SUV looks! Flexible seats configuration is great for hauling large loads especially from Malaysia. Its practically maintenance free, especially with the 5 year free servicing package and 10 year engine warranty. Sound proofing can be better, Seats can be more comfortable. This car is very practical for daily need as well. Outlander is an attractive, muscular looking 7 seater SUV. Priced attractively, with a 5yr warranty/10-y powertrain warranty, it ticks a lot of boxes. Its a relatively light vehicle in its class, hence gets reasonable fuel economy and acceptable power from its 2.4L engine. The 3rd row seats are tight, but has slightly more legroom (but less visibility due to window shape) than the X-trail. The interior design was a bit of let down though. Design feels rather dated and has mostly hard plastics through the cabin, and NVH insulation is light. All in, think its a good practical option, but scores more modestly in the refinement stakes. Tested the car on a rainy day. SE allowed a longer drive as not much customer around. Managed to get onto the highway. CVT + paddle shifters doesn't seems to work that well, preferred a Auto box with paddle shifters but Economy pushed most company to do CVT for better FC. off the line, the car is laggy, probably due to its weight. Tested the older version of Outlander too, but that CVT + shifter seems to work better and was more energetic. Car does roll about alot. 7 Seat option good for kids. My 7 and 10 yrs loves the space on the rear row. 2nd row is spacious. Getting to the 3rd for adult is difficult. 2nd row flows flat and is easily done, using when buying big stuffs or bringing bikes along. Engine is smooth and quite, well tested engine from the Mitsubishi stable. too much chrome on the exterior, would matt black all the chrome parts. blindspot on the rear window panel is very tight. Generally online feedback for the outlander was quite average. But my experience driving it for a week was quite decent. Although some people complaint abt Power but it was adequate for me. 5yr Warranty and 10yr engine warranty is probably the best in class. Just collected new car,it has 165hp giving the car boost and head start when it goes off the line,century sprint in 10.2 sec,great car with good fc.it has better third row space compared to wish, mzd 5,x trail and carens which are all cars i am deeply serious in buying as nissan gave me a very attractive price as i was driving the elgrand.so far no problems with the car,more than just adequate hp even when full loaded.consider it seriously please,very reliable!!! !Has 5=+5 years of warranty,not a single thing to worry about.guaranteed,comfort,excitement,thrill,space.very spacious boot when 3rd row unused.if compared to other competitors around the same price, i would say it is the x trail,which is severely under powered,however the zero gravity seats were extremely comfortable as compared to my old e250. Should definitely consider this car when looking for 7 seater . Many features available. Collected my new car and has been driving for a week. Very comfort car. Enjoy the driving. The car horsepower is adequate. Most importantly is the quietness of the car while driving. The interior noise level is really reduced a lot. Excellent improvement from MIT. This a practical SUV for Singapore market, especially when most family can only afford one car and the volatility of COE means most people should look into long term hold and use, vesus the days where Singaporeans change cars every couple of years. Overall power is good, not Sports car kind of overwhelming but power delivery is quite linear and progressive.This SUV also rides very comfortably and feels solid. Most importantly, drivng this car gives you the assurance of safety with its composed feel. Most online car reviews also have positive reviews for this facelifted model which looks more pretty than the old one. For those looking for an MPV for practical reasons but crave for a SUV, this car might make sense to you. Nice modern looks. Most people love the new refreshing design and road presence. Comfortable ride with the feel of a large car. Reliability of typical Mitsubishi cars. No turbo but don't really need it in often congested Singapore roads full of speed cameras. Lack of diesel option which works well on heavier SUVs to provide the low end torque. Not as spacious in the last row as Kia Sorrento. however the Sorrento is much more expensive. First looks, grills in-front looks captivating and fierce but somehow it looks like trying to imitate Lexus front stylish grills to me. The use of GDI engine is kinda old and seems sharing across with Kia too but they claim is different. The startup of the engine is ok but gear engages with some crank sound. The drive is ok at the start but when you throttle by tapping on it (not slamming) it somehow jerks and seems being pushed hard to do so which to me is not smooth and not acceptable. Gear changes are not smooth as well. Despite being a 2.4L doesn't perform like one at all and seems like its struggling to move at all times. I wonder what will happen if its fully loaded. Overall, its an affordable or in fact the cheapest 7 seater and a 2.4L SUV to get compare to other similar 2.4L makes like Hyundai SantaFe or even the Kia Sorento but given a choice, I think I rather Out this Lander instead. Authorised Distributor Mitsubishi cars are Mitsubishi ASX Reviews, Mitsubishi Attrage Reviews, Mitsubishi Eclipse Cross Reviews. Parallel Imported Mitsubishi cars are Mitsubishi Fuso Canter Reviews, Mitsubishi Fuso Fighter Reviews. sgCarMart is the number one car site for buying Singapore cars, including new cars, parallel import cars, Toyota, Honda, Nissan, Volkswagen, Mitsubishi & BMW. We have new car dealers comprising parallel importers, authorised car distributors, and used car dealers who have the New Mitsubishi Outlander latest price Find new car pricelists, new car launches, new car promotions, new car reviews, latest car news & car articles. Read the New.Mitsubishi Outlander consumer reviews to help you decide on buying a car. Also join our car discussion and forum discussion for car reviews, motoring news & motoring guides. Visit our partner sites who have job openings for Singapore jobs, Singapore classifieds, mover and real estate properties for sale.